Good news, everyone! A recent lab experiment by NASA scientists has revealed the precise aromatic quality of Saturn's largest moon, Titan. And like a fine wine, it has a "strong aromatic character." 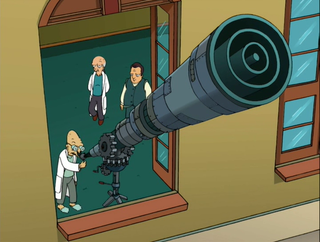 Unfortunately, NASA doesn't have a Futurama-like smell-o-scope at its disposal. Instead, its scientists were able to "reverse engineer" the recipe that makes up the flavors of Titan's brownish-orange atmosphere. And in fact, the process of doing so helped the NASA team to classify a previously unidentified material discovered by NASA's Cassini spacecraft in the moon's atmosphere. "Now we can say that this material has a strong aromatic character, which helps us understand more about the complex mixture of molecules that makes up Titan's haze," noted Melissa Trainer in a NASA statement. She's a planetary scientist at NASA's Goddard Space Flight Center in Greenbelt, Maryland. To recreate Titan's atmospheric conditions, the researchers combined gases in a chamber to let them react. Given the right conditions, these reactions should produce the same products found in the atmosphere of Saturn's largest moon. The process, says NASA, is like being given a slice of cake and trying to figure out the recipe by tasting it; if the new cake tastes like the original, the correct ingredients have been chosen. In this case, the best results occurred owing to the addition of an aromatic that contained nitrogen (it's a material that contains aromatic hydrocarbons, including nitrogen — a subgroup called polycyclic aromatic nitrogen heterocycles). Analysis of this particular recipe revealed spectral features that matched up well with the distinctive signature that had been pulled from Cassini.